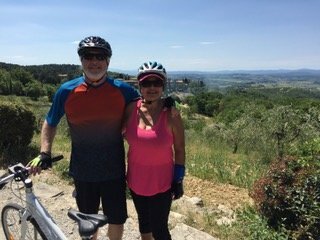 Debra and I would like to thank you for a wonderful bike ride in Tuscany. Our guide was knowledgeable skillful and always was looking out to ensure our safety and to ensure that we enjoyed our ride. The ride was everything promised on your website and more! Thank you for a wonderful ride. We highly recommend I Bike Tuscany! I just wanted to send a quick note to thank you for the amazing day spent biking through the Chianti region. We all had the best time and you made it so! Thank you for taking such great care of us and maybe challenging us just a little. I will write a review when I get home but I did not want to leave without saying Thank you! You two are awesome at what you do! Hope to see you again someday! Elizabeth - Thank you again for the wonderful tour! I have just arrived home and can't believe how beautiful Italy is. The bike tour was one of our highlights, and I am very glad we chose the e-bikes, they were fun and definitely needed to help get up those hills. The wine and lunch were amazing also. A perfect day! Susana and I are now back home in CA and wanted to thank you for such a memorable experience! You are the best and your assistant Chris was wonderful! Susana wanted to thank him once again for his patience, support and help climbing the ‘last’ hill into Siena. She told everyone on our trip about it! Thanks again for your ride back to the train station and all your attention. 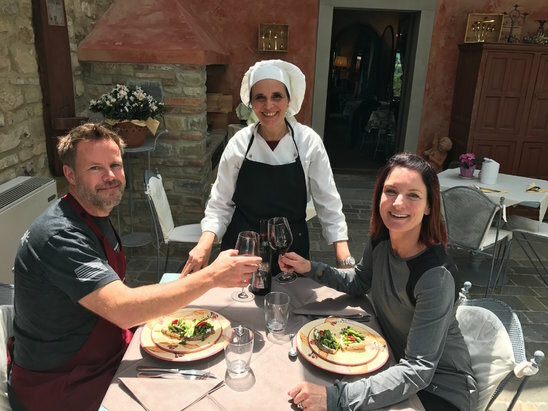 I have told all my biking friends about your company and if we ever return to Florence, we’ll be sure to go on another bike ride with I Bike Tuscany. Take care and I wish you all the best in the 2017 biking season! I just wanted to let you know that we had a fantastic day riding with Chris in Tuscany today. Chris is the best guide we have ever had... he was very attentive and we felt completely at ease as he was guiding. We will recommend I Bike Tuscany to our friends for sure and if we come back we will do another tour!